What is the JavaJug made of? It’s made from virgin (not recycled) food grade stainless steel. How much does the JavaJug weigh? It’s pretty light, only about 312 grams or 2/3 of a pound. How strong is it? Won’t the metal bend on impact? It’s very strong. We have hit it hard with a hammer and it does not leave a dent. Just rinse with soap and water after use. The jug is one-piece construction, so there are no grooves or edges in it to capture dirt. It’s very easy to clean. How much brewed coffee does the JavaJug hold? It holds up to 32 ounces, or 946 ml. Won’t the rubber plunger end be compressed inside the chamber when storing the AeroPress in the JavaJug? No, the plunger end is pushed all the way through. The filter cap may be stored in the bottom of the JavaJug, or placed loosely on top and held by the tab. Does it have a double-insulated design to act like a thermos to keep coffee hot? No, it’s single walled. 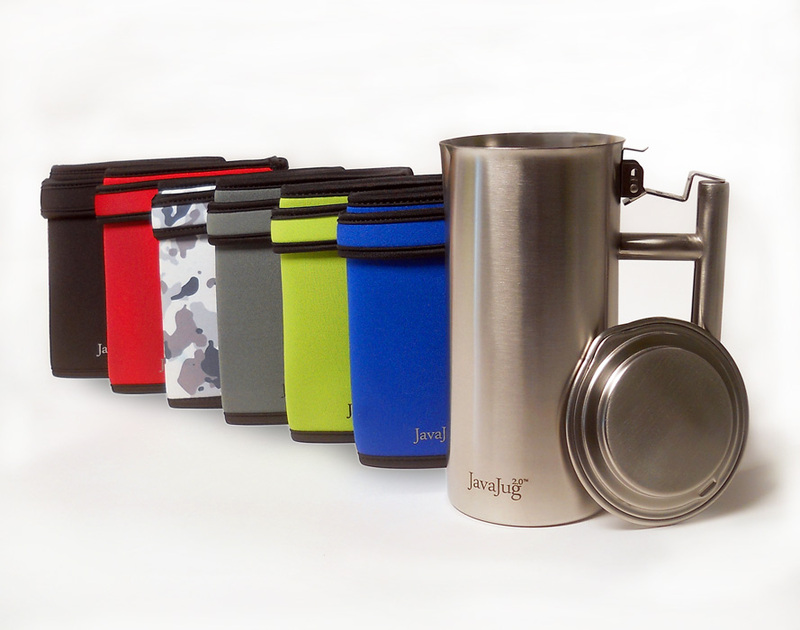 The JavaJacket helps insulate the side walls, but it’s not the same as a double-insulated mug. Where can I purchase a JavaJug? Can I buy one in a retail store? Some. See our retail locations. We are establishing retail dealerships now. If you would like to carry the JavaJug in a retail store, please contact us. JavaJackets help keep the coffee warm and your fingers cool. Available in red, blue, black, grey, lime green and camouflage.